(from top left) Scott and I treated ourselves to a food processor with his Tesco vouchers (and I'm stupidly excited about it). Cocktails and burgers with my flatmate at Boozy Cow on Tuesday. More lunch prep this week - I made Chicken Burrito Bowls from Tasty. 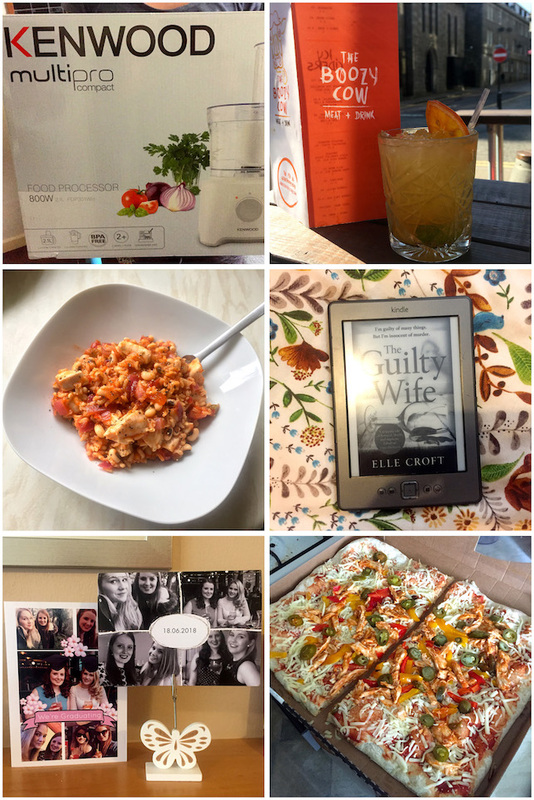 Finished 'The Guilty Wife' on Friday and honestly it wasn't for me (see the full review here). Graduation cards from my flatmate and too my flatmate. On Sunday Scott and I bought a huge pizza from Costco and it was delicious. Let's start with the big news shall we? On Friday morning I found out I'll be graduating with 2:1 in Geology and Petroleum Geology. I phoned my mum seconds after I found out and cried it was such a relief. This last year has been tough and I honestly thought the grade I was hoping for had slipped out of my hands. Apart from that there has been lots of other good things happening this week. On Monday I bought a food processor - something that I'd been after for a while and promised myself at the end of uni. On Tuesday I eat burgers and drank cocktails in the sunshine with my flatmate as a little pre-celebration. The rest of the week was either spent at the gym or refreshing my emails every 5 minutes waiting to hear about my degree classification. When I found out on Friday I called round all my family then went into town with the intension of treating myself to a jumpsuit I'd spotted in Primark. Sadly the fit wasn't right for me but it couldn't bring my mood down. On Saturday Scott came to Aberdeen and because the sun was shinning we went for a long walk down to the beach and made burgers for tea while we watched the season finale of Hell's Kitchen All Stars. On Sunday we visited Costco for some essentials and picked up a massive pizza for tea. It was honestly one of the best shop bought pizzas I've ever had so I would 100% recommend it. I'm still absolutely delighted about my degree classification and have lots more holiday photos to share with you so it is going to be a good week.